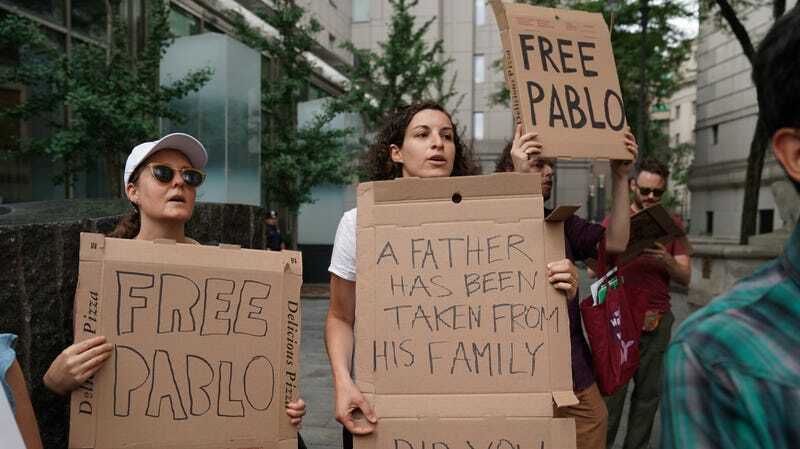 Last month, Ecuadoran immigrant Pablo Villavicencio Calderon was detained by ICE after delivering pasta to U.S. Army Garrison Fort Hamilton, the only army base in New York City. Although Villavicencio had delivered food there many times from Nonna Delia’s pizzeria in Queens, on this instance, a routine background check revealed that he had an active ICE warrant. Since then, he has been locked up in immigration detention in New Jersey, narrowly escaping the agency’s deportation effort. Finally, a federal district court judge has ordered Calderon’s release after 53 days, according to The New York Times. “Judge Paul A. Crotty, an appointee of President George W. Bush and the former corporation counsel for Mayor Rudolph Giuliani, pointedly questioned the government about why it had detained Mr. Villavicencio and planned to deport him. ‘Is there any concept of justice here?’ Judge Crotty asked the government’s lawyer.” The government lawyer, according to the Times, “stammered” and said that the decision was made by the Department Of Homeland Security. After the judge declared that Calderon posed absolutely no threat to the country, the man was released and reunited with his wife and two young daughters. The hashtag #PabloVillavicencio is trending on Twitter right now, as many celebrate the happy (if belated) ending to Calderon’s story. The same day of his release, he began application proceedings for his green card.